Over the past month, Gekko has added another two awards to their collection with a win at the IPM COGS Awards in the Best Experiential category, and a highly commended in the Creative Industries category at the London Loves Excellence Awards. 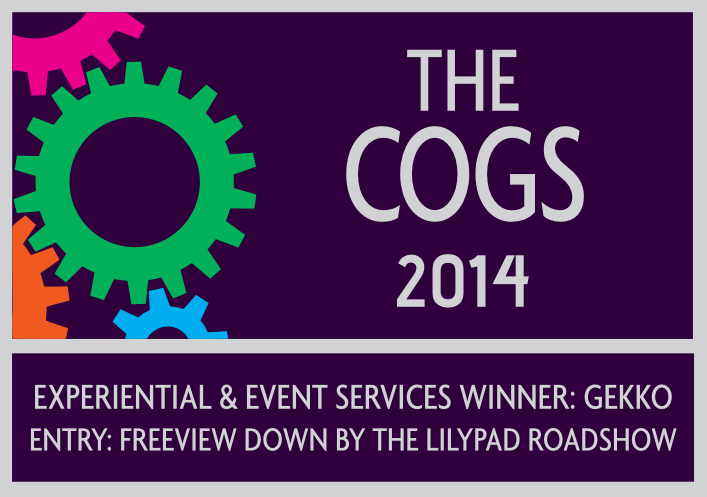 At the COGS Awards, Gekko’s ‘Down by the Lilypad’ campaign for Freeview impressed the judges with its creativity, effectiveness in communicating Freeview’s brand message, and impressive results. The Institute of Promotional Marketing hold the COGS Awards each year to recognise and reward the achievements and successes of the UK’s marketing service providers. Gekko was also highly praised at the London Loves Excellence Awards for its innovative approach to the channel, and for its clear consumer focus. The London Loves Excellence Awards takes place each year to recognise talented individuals and organisations in the capital.